Rupes Casellae, mense Maio 2007 visum. 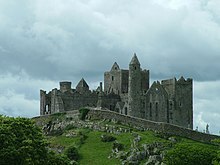 Rupes Casellae (Anglice Rock of Cashel); Hibernice Carraig Phádraig), etiam Anglicae Cashel of the Kings, "Casella regum", et St. Patrick's Rock, "rupes Sancti Patricii", est arx mediaevalis, Casellae in urbe sita Comitatus Tiperariensis Meridiani Hiberniae. Vicimedia Communia plura habent quae ad Rupem Casellae spectant. Haec stipula ad architecturam spectat. Amplifica, si potes! Novissima mutatio die 11 Octobris 2013 hora 16:32 facta.